Before we talk about the five books, can you give me some examples of how you have seen leadership helping children with their education? My belief is that every great teacher is a great leader. That is a core skill of teaching, because the definition of leadership is bringing people to a place they need to get to, that they themselves don’t think they could reach. I have seen a number of teachers who have set ambitious goals and used strong values within their classroom. They have worked relentlessly with their pupils, pupils who at the beginning of the year did not think they could achieve such results, to exceed their expectations. This is true leadership. I have also met headteachers who have been able to instil that ethos in all the employees in their school. Great teachers use lots of different techniques to lead their students. For example, I recently saw a lesson where the teacher was illustrating Pythagoras’ theorem by taking his class of boys out to the football field to measure where they would have to stand in order to score a goal directly from a corner kick. The class then measured the different lengths and angles. I thought that was a really creative way of teaching the theorem. Let’s discuss what makes a good leader. 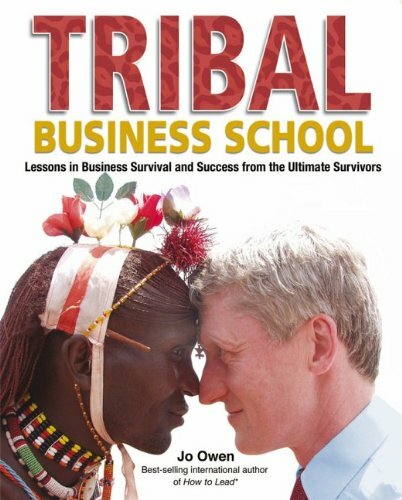 Your first choice is Jo Owen’s Tribal Business School, which explores how we can learn lessons of survival and success from different tribes around the world. What is interesting in Jo’s book is how he shows that the challenges of leadership are so similar even if they are set in diverse contexts. I think it is a good example of how people who think of themselves as leaders in countries like Britain, and think they have very stressful lives, need to understand that it is much tougher for many leaders in other parts of the world. If you take the example of some tribal leaders, in many situations leadership decisions for them really are a matter of life or death. Within these tribes, if the leaders fail then their family and the tribe could die of starvation. So I think this is an extreme reminder, when you lead an organisation, that there are more difficult forms of leadership out there than we have to deal with. What are some of the qualities that make a good leader that might surprise people? One of the lessons I took from the book which might surprise people is that there is no universal leadership model. People look for the perfect leader but there is no such thing. I think the right leader is right for his or her context. So someone who can lead a tribe in the deserts of Africa would not be successful leading the same tribe in the snows of northern Norway. Everyone has to find their own leadership model and adapt it to their context. But the one quality that I think does unite all leaders is the importance of strong values, which is discussed in all my book choices. All the successful leaders in the different tribes build strong values within their tribes. Another lesson that I took was that the best leaders avoid direct conflict if there is another way to achieve their goals. Then, if you do need to fight, make sure you have as much of an unfair advantage as possible. And presumably it is a good idea not to fight within the tribe as well. Yes, and one way to do that is to create an esprit de corps and really strong values within the group. 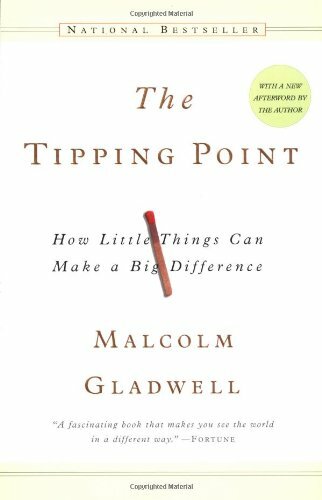 Next up is The Tipping Point by Malcolm Gladwell, which looks at how little changes can have big effects. 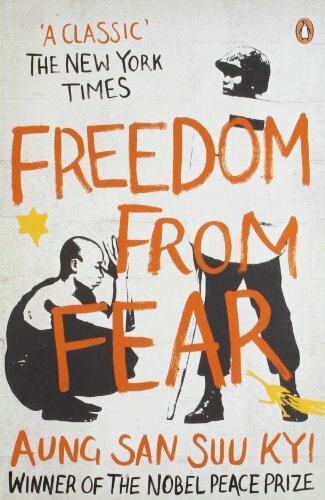 This was a book that I read when I was starting Teach First, and it had a big influence on me. I had all my early staff read it. I think the leadership lesson here is that big change can happen through little things. For example, at Teach First when we began, people thought that it was impossible and that exceptional graduates would never be interested in teaching in challenging schools. It meant completely tipping people’s perception of it, to do something that no one would dream of doing. We were aiming for it to be the absolutely most prestigious thing that people would want to do – even more so than being employed by the top employer out there. I took other lessons from The Tipping Point, such as the importance of using connectors. That is, developing relationships with a few key people who can positively influence others. We used this approach on different university campuses where we found the people we thought would be able to convince others well, and trained them to be Teach First campus brand managers. There is also the idea of the “stickiness factor” [of your organisation’s message]. This was particularly important at the beginning of Teach First. For example, we used some very radical approaches that flew in the face of current thinking. We told people that working for us was not a lifelong sentence. They could keep their options open, which is not something that you hear from most graduate recruiters. We wanted to do things differently. Malcolm Gladwell also talks about the power of context. I remember going to university careers services or careers fairs in those early years and ensuring that all our Teach First material was put in the business section rather than the teaching section, so that people thought about us differently. What I wanted was for people who would normally look for a job at Accenture or Goldman Sachs to look at Teach First as well, rather than targeting people who were already looking at going into teaching. Right from day one I wanted people to see us as the most prestigious top employer in the country rather than another route into teaching – a career they might have previously discounted. These were all lessons I learnt from this book. 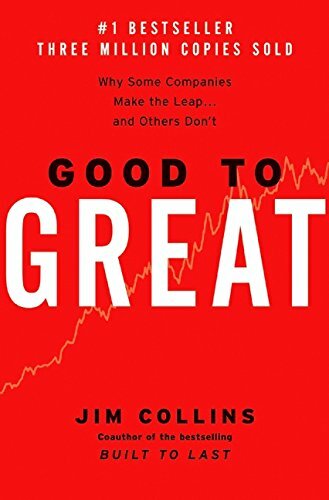 In your next choice, From Good to Great, Jim Collins explores what makes a truly exceptional company. The Tipping Point was more important for the early part of Teach First, and this book was a kind of follow-on. It is really about how you change and break through in an organisation. There are a few points he makes that I think are really important. One of the main ones is the idea of “level five leadership” – that the best leaders “build an enduring greatness through a paradoxical combination of humility and professional will”. I think it is this combination of humility and will that is important in so many great leaders I have seen. You need the humility to take feedback and constantly be looking to improve, and not think you are the magical leader who has all the answers. Yet you still need to have that steely will which enables you to take things forward. That is a very powerful combination. Also there is the idea again of creating good values. All five of these books have that in common, the importance of values. Jim Collins talks about confronting the brutal facts which are really important. There is this idea of a culture of focused discipline which you get in my first choice as well. For example, if the tribal leaders spent too much time thinking about the colour scheme for their office and not about the big stuff – as some corporate CEOs have in the past – then their tribe would be decimated, and the same thing applies to an organisation. You need to concentrate on the important things. You need to be goal-focused and simple. This is the hedgehog concept [originally formulated by Isaiah Berlin] of focusing on what you do really well. Recently there has been a lot of talk about Apple losing Steve Jobs, and the effect that will have on the company. Do you think a great company like Apple will fail because the leader has gone, or is it the job of a good leader to leave a legacy where that doesn’t happen? I don’t know enough about the internals of Apple, but if Steve Jobs was as great a leader as people say then it won’t fail because that is a mark of great leadership. It is the clear values and laser-like focus that the whole company has, which have been facilitated by the leader, which will enable a smooth succession. Aung San Suu Kyi was awarded the 1991 Nobel peace prize for courageous leadership of the Burmese people. What kinds of thing did you learn about leadership from her book Freedom from Fear? Possibly more so than any other leader in the world today, she lives strong values in her every decision. We have seen that her values and focus on her mission – the freedom of the Burmese people – are more important to her than her personal freedom, and even being able to see her family. She was tortured, put under house arrest and not allowed to see her dying husband because of her values. There is no more powerful leadership story. As you read this book, you can see similarities with the previous book’s idea of “level five leadership”. In Aung San Suu Kyi there is a gentleness, humility and amazing spirit of reconciliation with some truly horrible people, but also the most iron will. She could easily leave the country at any point, but she has chosen to stay. It certainly puts into perspective some of the leadership challenges that any of us might have if we are working with someone you don’t agree with. This is the extreme. And one of the worrying things about this example is that we don’t really know if she is going to overcome such incredible odds and finally succeed in her goal. She might die before she can do that. Whether she is ultimately successful or not, though, does not minimise the power of her leadership to so many millions of people. There are certainly not many world leaders who would stand up to her example. Your last book is The Book of Exodus in the Old Testament. I wanted to throw this in because I think a lot of leadership books believe the problems that leaders are dealing with are all new, and have never been dealt with before. But in an example that almost seems trite, because it is such a part of our cultural knowledge, if you read the book of Exodus from the point of view of leadership theory there were the same leadership lessons 3,000 years ago that people talk about today. For example, the leadership style of Moses in this book broadly has the combination of humility and will discussed by Jim Collins. He needed a great deal of convincing that he was the one who should be leading his people, but once he became that person he had the iron will to be the leader they needed. The story can be read as a company that had a slave mentality, and what Moses did was the biggest organisation turnaround in world history. There was a group of a million or so people, who had for generations seen themselves as slaves and a lower form of life within the mighty Egyptian nation, and through a very strong values-based leadership, Moses turned them into a proud people who went on to build a nation and influence western culture today. What is the 10 commandments but a series of values that could be used as a leadership tool to unite a people? There are also great examples of how he used modern management techniques, which consultants charge a lot of money to teach today. One of the things he did very powerfully was to appoint a strong senior leadership team to make up for his personal deficiencies. He understood quite clearly that there is no such thing as a perfect leader who can do everything well. For example, because he wasn’t a confident public speaker, he brought in Aaron to be his spokesperson. He brought in Jethro as an organisational consultant, to determine how to structure reporting lines during the journey in the wilderness. And he had Joshua as his military leader. It is clear that he had lots of gaps in his leadership ability, but what he was good at was finding the right people to fill in those gaps. So what did Moses have to offer himself? What he had was a very strong vision of where they needed to get to, and he was the custodian of strong values. He was also excellent at managing upwards – he had good relations with the chairman upstairs! That’s very important for any successful CEO. As a leader you shouldn’t do everything yourself. To sum up, what are the key leadership skills to remember? A combination of humility and will is very important. You need strong personal values, a strong vision, and a belief that you will achieve even the most unlikely goals.